Today’s post concludes a tetralogy base on the Imbibe Magazine article “Simple 4 Ingredient Cocktails“. But before we have a go at the cocktail, astute reader may notice that the blog has a new name and a new look. B and I decided to start hosting our blogs (and thereby get rid of the annoying ads), which seemed an auspicious occasion to change the name of the old CocktailsWithM.wordpress.com to the new MolecularDrinking.com. All of the old posts are now here. While the old blog will continue to exist, new posts, including this one, will only appear on Molecular Drinking. So without further ado, the Patricia Anne cocktail. As I mentioned earlier, this is part of a 2013 article in Imbibe where they asked four bartenders to come up a cocktail based on only four readily available ingredients. The idea was that the enduring cocktails like the Manhattan, the daiquiri and the martini are great because of that magic gestalt of that happens when a few ingredients come together. The three previously covered entries: the Django Reinhardt, High Noon and The Graduate cocktails are all very different from each other, but impressive and enjoyable in their own ways. Today’s cocktail was created by Matthew Lipsky at the time of Charcoal Bar in Chicago. 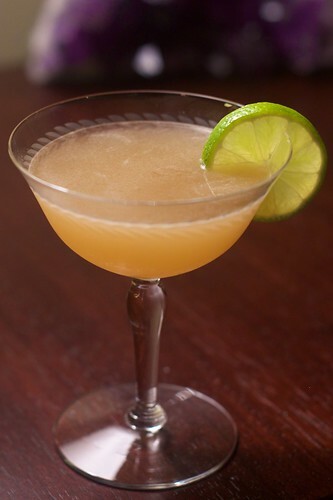 The Imbibe article describes the “formula for a fresh Gimlet” with “couple of flavorful tweaks”. As we have discussed previously on the blog, a Gimlet really has to be made with a lime cordial, not lime juice. A “fresh Gimlet” is probably best called a Bennett cocktail, but I get why one wouldn’t say that in a major magazine. The bitters add a nice edge of complexity to an already nice cocktail and the honey syrup somehow seems to soften the edges a bit. Combine the ingredients and shake with ice until chilled. Strain into a chilled coupe and garnish with a lime wheel. Thi one is definitely a nice choice for summer refreshment, which, where we live, begins in February.